This shop has been compensated by Collective Bias, Inc. and its advertiser. All opinions are mine alone. #RumInTheSun #CollectiveBias The following content is intended for readers who are 21 or older. Sometimes you just need a good, flavorful drink! 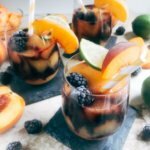 I love to shake things up with fun and refreshing cocktails, and this Blackberry Peach Frozen Daiquiri is a great way to enjoy fresh fruits! Paired with a quality rum, these daiquiris are so easy to drink and perfect for warmer summer weather. 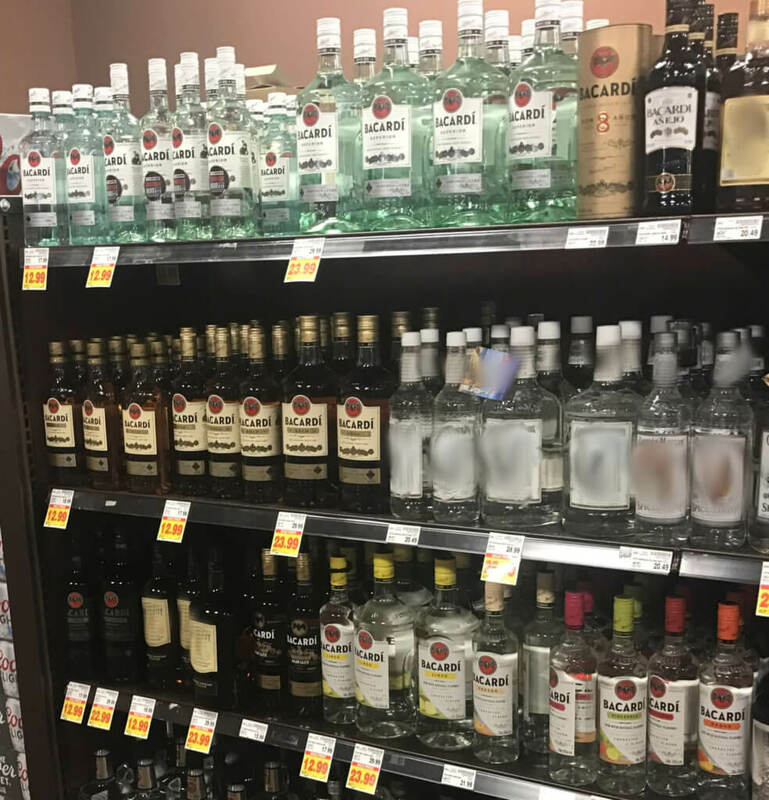 Bacardi has always been one of our go-to liquors and we always have some on hand. I love how versatile rum is as a spirit, and being a fan of Bacardi it is easy to use in so many cocktails and with so many mixers. 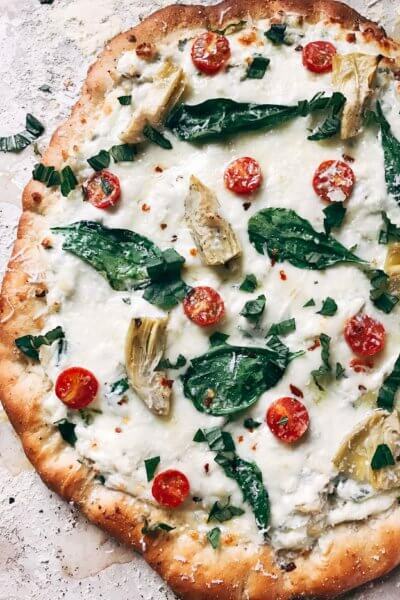 It is a definite favorite at our dinner parties! The Bacardi Superior is classic (you can’t go wrong with it!) but I also love to use the flavors, like their new Banana flavored rum! And right now you can find an on-bottle code for $5 in Live Nation Concert Cash® (or 2 codes for $15). 21+. State exclusions apply. Visit www.bacardisummermusic.com for details and restrictions. With Live Nation and Bacardi partnering, you can enjoy your summer rum punches with the chance to win a concert trip anywhere in the world. You can enter the contest online (no purchase necessary) for a chance to win concert gift cards, Rock Flights, and Ultimate Concert Access Passes with prizes awarded daily. 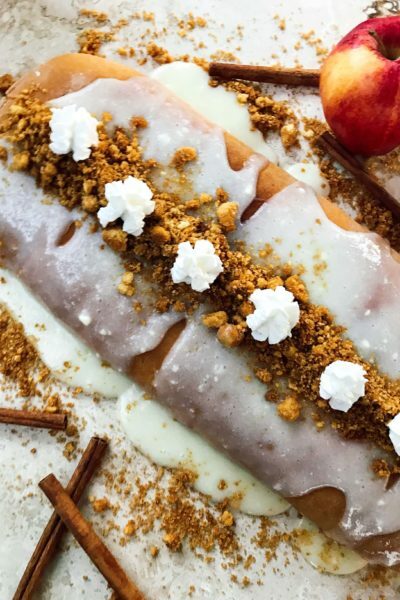 I love to travel and I always incorporate food in any way that I can when I am visiting a new place. When we were in Puerto Rico several years ago, we were able to visit the Bacardi distillery where this rum is made. It was an amazing experience! We got to go on a tour of the grounds, learn some cocktails featuring Bacardi rum, and of course we took some home with us. (Plus we got to enjoy some different and new cocktails as part of the tour!) 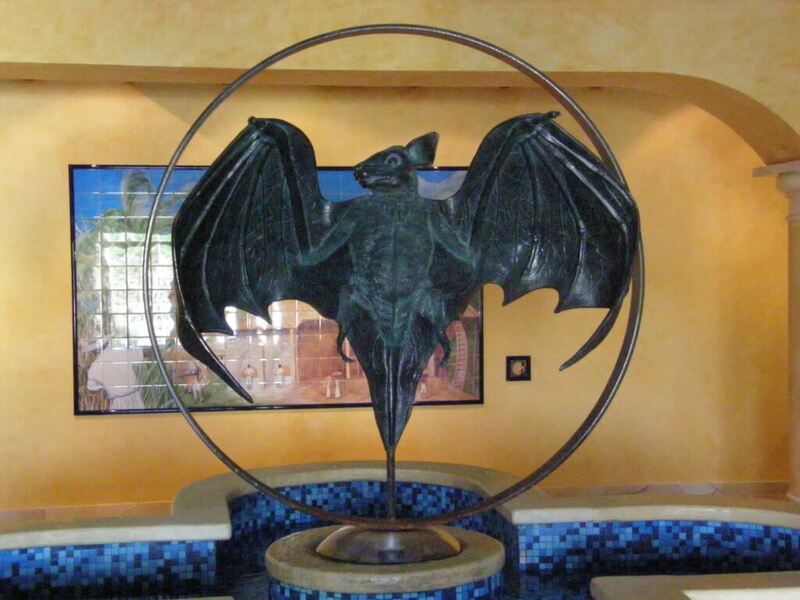 Their famous bat logo is because there was a colony of fruit bats in the first distillery, which was then selected as their symbol and found all over their current property. This started our “tradition” of visiting distilleries all over the world because it was such a fun experience! If you are ever in Puerto Rico, you should make a trip to Bacardi! 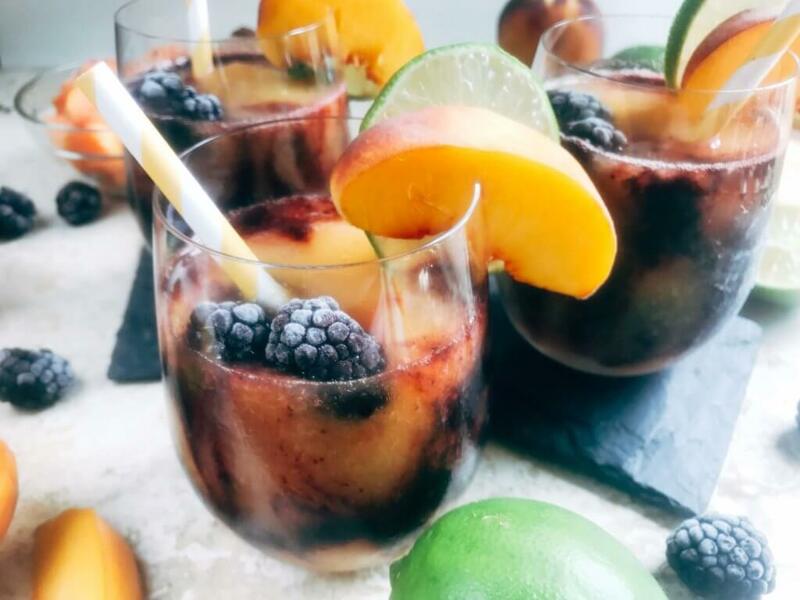 You can make this Blackberry Peach Frozen Daiquiri with any fruit combination that you would like, but I am in love with this one! I am lucky enough to live in Colorado, and we have the famous Palisade Peaches that grow on the western slope (west of the mountain range). They are a little less sweet than Georgia peaches, which is what I like! So I knew I had to make a cocktail that would feature these amazing fruits. 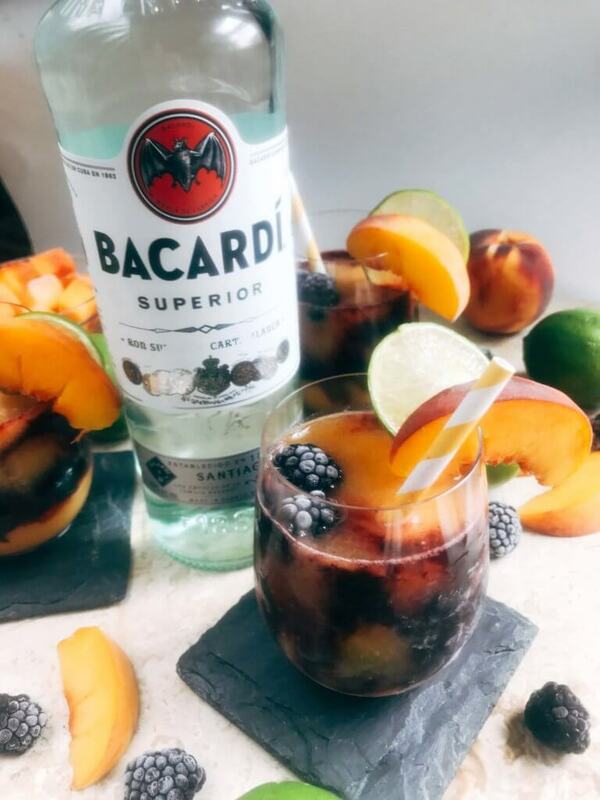 To make the Blackberry Peach Frozen Daiquiri, first combine the frozen blackberries, Bacardi Superior Rum, lime juice, simple syrup, and ice in a blender. Combine until smooth. Then store it in the freezer for a few minutes to slow down the melting while you do the same with the peaches. Then layer the two mixtures in a glass and use a straw, poking through the mixtures in a vertical pattern, to make the swirl effect (instead of lines). Serve immediately! That’s it! 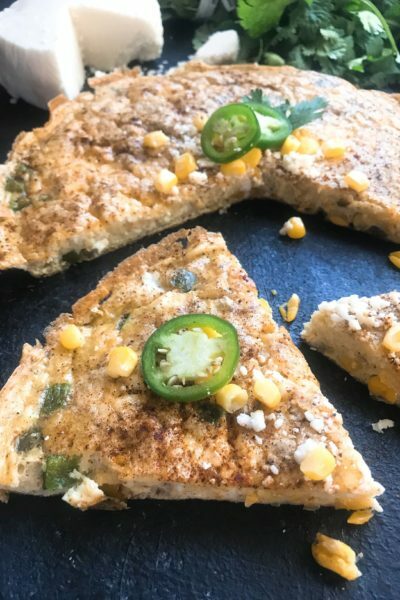 Fast, simple, and delicious. You can grab Bacardi Superior Rum and Bacardi Banana Flavored Rum at your local liquor or grocery store. 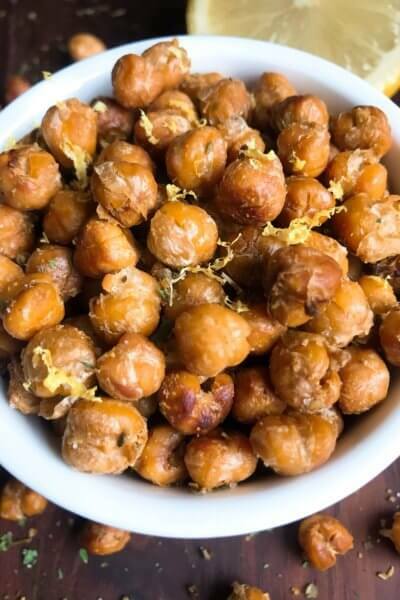 They are easy to find, and you will have a plethora of flavors to pick from! 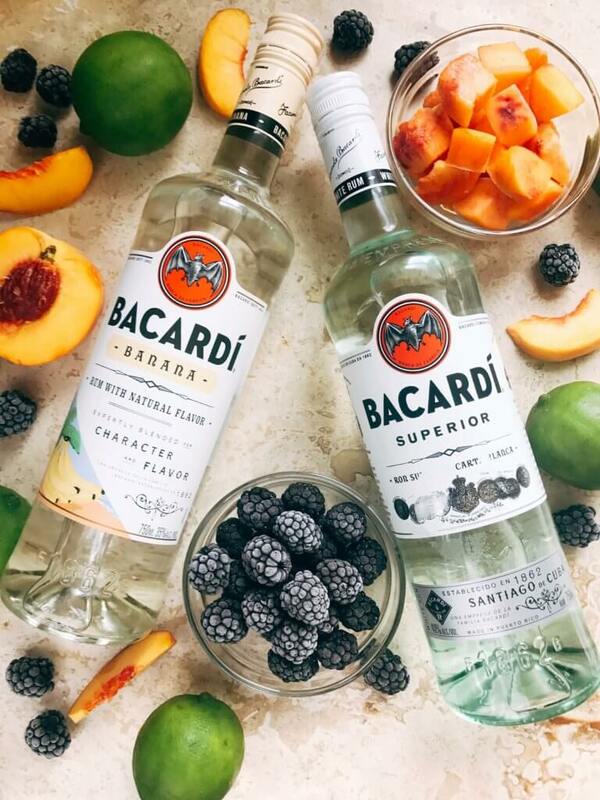 Make sure to stock up on Bacardi Superior since it is so easy to use in so many ways! 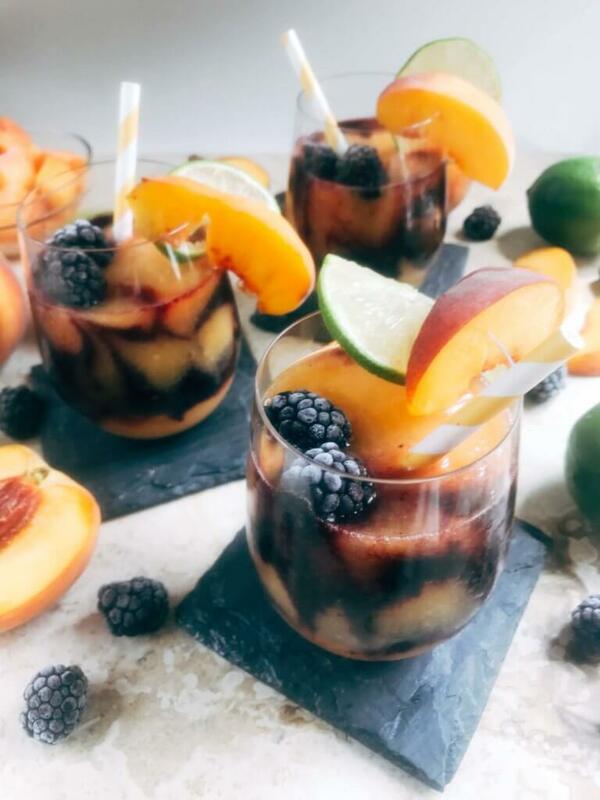 You can get creative by using different fruits in this recipe, but I am in love with the combination of peach and blackberry. What are your favorite summer fruits that you would use? 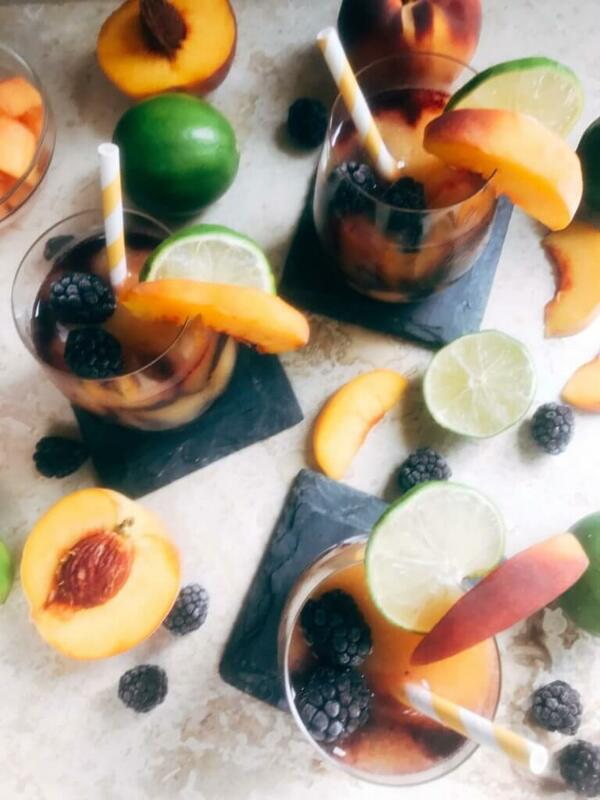 Quick and easy cocktail that captures your favorite fruits in a classic rum drink. Place the frozen blackberries, 1/3 cup Bacardi Superior Rum, juice of 1/2 lime, 1 1/2 Tbsp simple syrup, and 1 cup of ice in a blender. Process until the berries and ice are broken down. Transfer the berry mixture to a large glass or container and place in the freezer. This will help prevent it from melting as you prepare the peaches. Rinse out the blender. Combine the frozen peaches, 2/3 cup Bacardi Superior Rum, juice of 1 lime, 3 Tbsp simple syrup, and 2 cups of ice in a blender. Process until the peaches and ice are broken down. 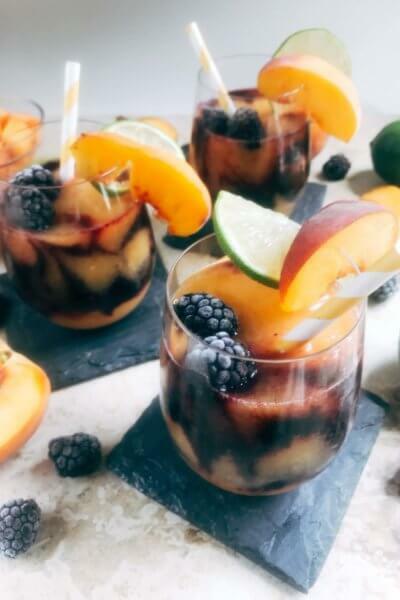 Using a spoon, alternate layers of the peach and blackberry mixtures into four serving glasses. Use a straw and poke through the drink vertically to make the layers more of a swirl. Serve immediately. Using frozen fruits helps keep the mixtures in a thicker texture. Change up the ratios of each fruit to your preference. This sounds absolutely fabulous! I wouldn’t mind one right now. This is a great weekend drink! It looks and sounds great! I bet that Bacardi is perfect in this recipe. It really is! 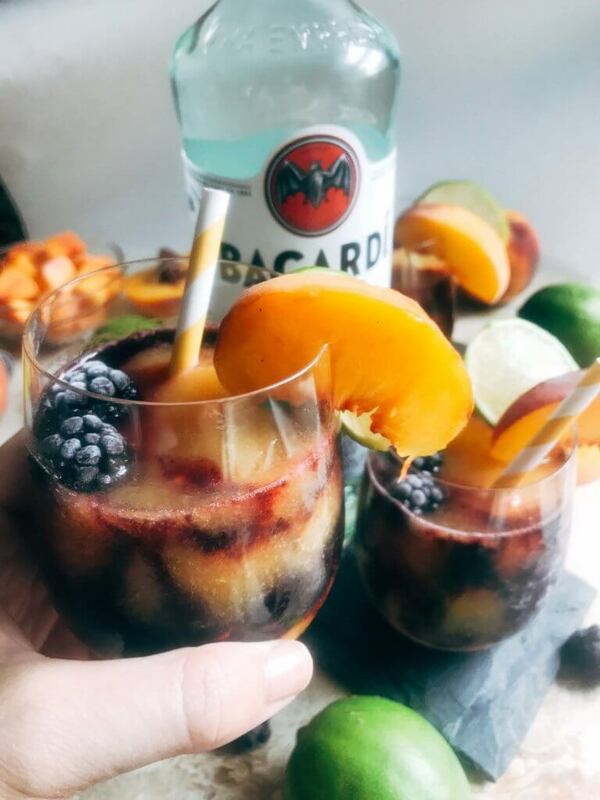 Bacardi is perfect for so many mixers!